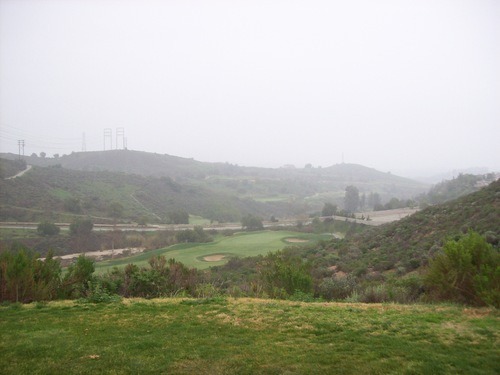 This Saturday, I made my way up to Moorpark to take care of a little “unfinished business.” I have only played here once before and there was one nine at this 27-hole complex that I didn’t get to experience last time. 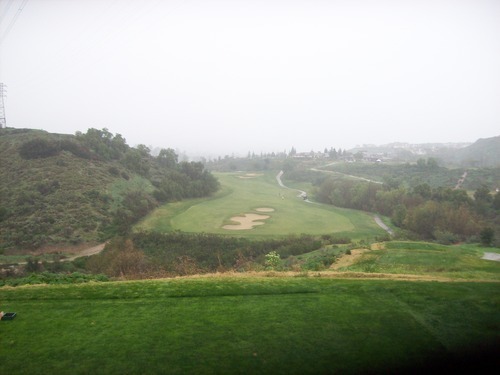 On my previous visit, I played the Creekside and Ridgeline nines, and I loved both of them, so I’ve been looking for an excuse to come back and check out the Canyon Crest nine. 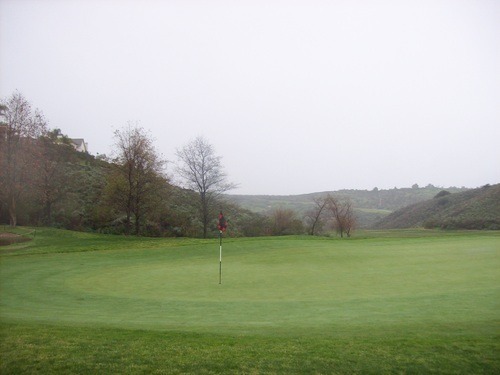 I found a reasonable deal on GolfNow ($55 for a 12:40 time) and called ahead to make sure I’d be getting to play the Canyon Crest nine as part of my rotation. When I left my home in Orange County a little after 10:00, there was not a cloud in the sky. 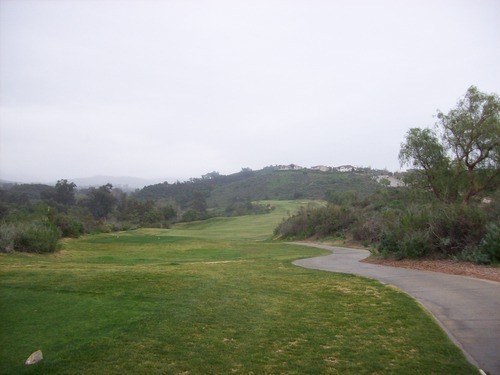 I saw some live shots of Torrey Pines to the south and it also looked gorgeous. So I never thought to check any weather forecasts before heading further north to Moorpark. As I entered LA County, the sky was much gloomier, but it was still just a harmless overcast look. As I entered Ventura County coming through Simi Valley, the mist got thicker and it started to sprinkle on my windshield. Uh-oh! 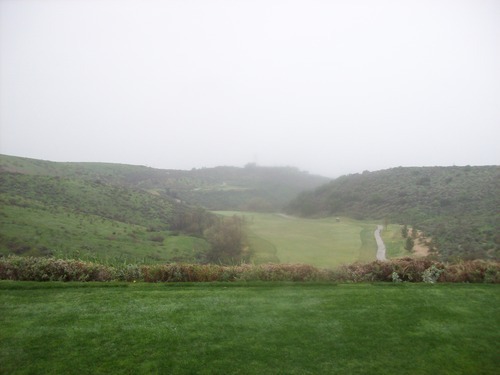 At the course, there was just a light mist and nobody seemed to bothered by it. 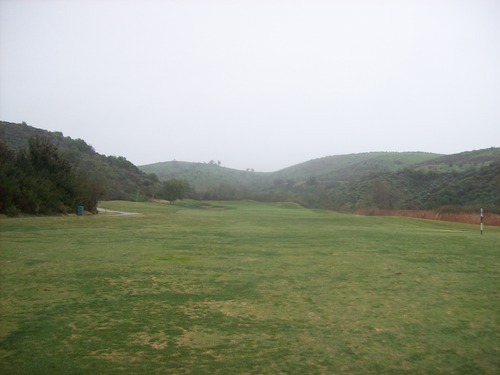 There were plenty of golfers ready to play and the staff seemed confident the drizzle would pass quickly. Unfortunately, it didn’t. I was paired with another twosome and we started on the Creekside nine right on time. 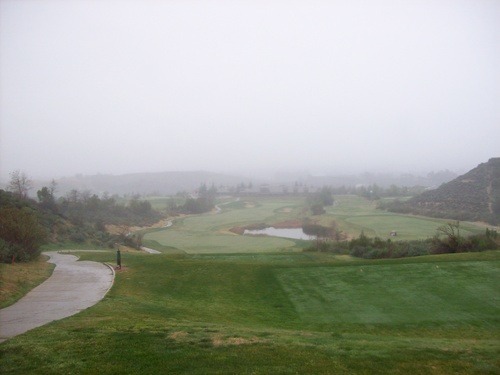 By the 5th hole, the rain picked up and we were starting to get soaked. Then, it just got worse over the next few holes and I was reduced to wrapping a towel around my grips just to hold onto my clubs. The other two guys bailed out and went back to the clubhouse to wait out the worst of the rain. I trudged on and finished out the front nine by myself. At the turn, I ran out to my car to grab the snazzy new Srixon rain gloves I had purchased earlier this winter. I probably should have took those with me from the start, but oh well. It was nice to finally put them to the test and I must say they made a huge difference. Grip was not an issue anymore, though my hands inside got pretty toasty and sweaty after awhile. It’s too much work to take the gloves on and off in between shots, so I just kept them on the whole time. The other good news is that everyone else seemed to be scared away by the rain, so by the time I made the turn onto Canyon Crest I had it all to myself and I was able to get around quickly. Still, I was pretty soaked by the time I finished. Anyway, the rain did put a literal and figurative damper on the round and it was hard to fully enjoy the experience. 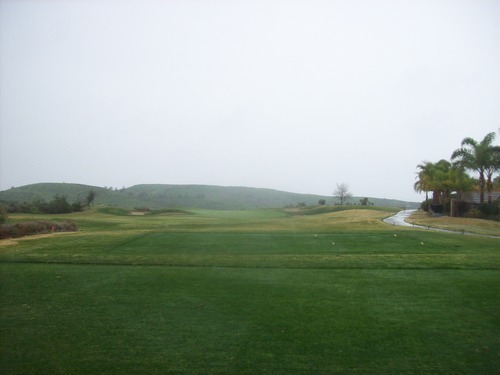 I still love the layout at Moorpark, but the winter conditions were just so/so. When I played here before, I definitely liked the Creekside nine better than Ridgeline, but both have several distinctive holes. The 4th and 5th of Creekside are great contrasts. 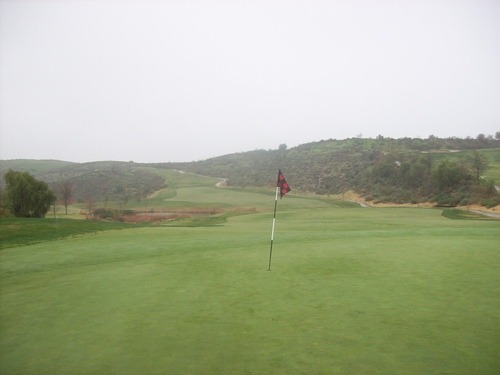 The 4th is a long par-4 that plays uphill all the way. 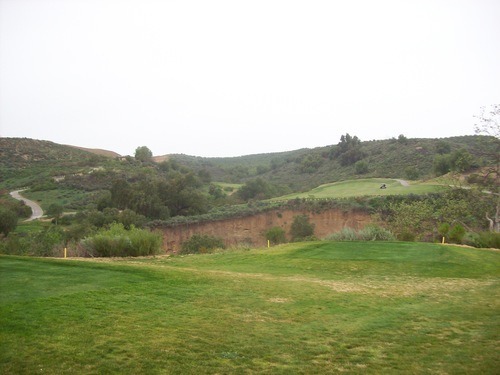 The tee shot is across a canyon to a patch of fairway that looks smaller than it actually is. 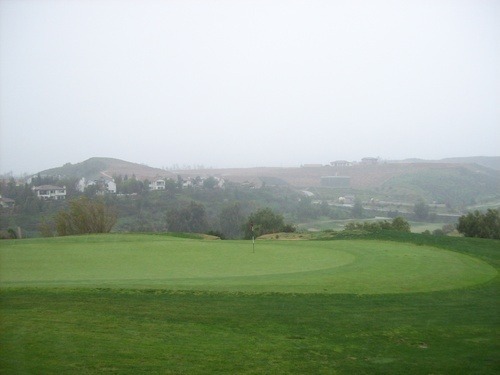 Then, you hit further uphill over another ravine to the green that’s pretty well obscured from most approach views. The 4th is a tough one, but then the 5th is very fun and relatively easy. 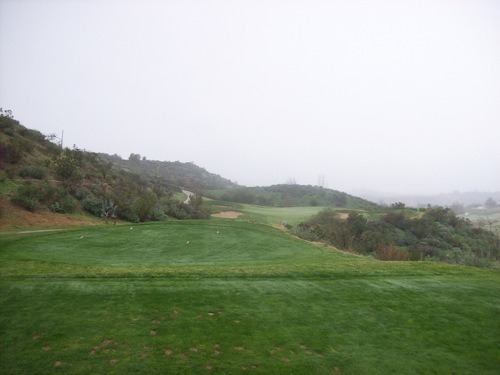 It’s another par-4, but maxes out at just over 270 yards and plays straight downhill. There’s ample room for error, so it’s one that everyone can go at aggressively to try and drive the green. The 6th is a great par-3 to follow it that also plays straight downhill and the 9th is a fun finisher. As I somewhat expected, the Canyon Crest nine is the weakest of the three in my opinion. It’s pretty straightforward and the hazards, hills and undulations aren’t quite as severe as on the other courses. 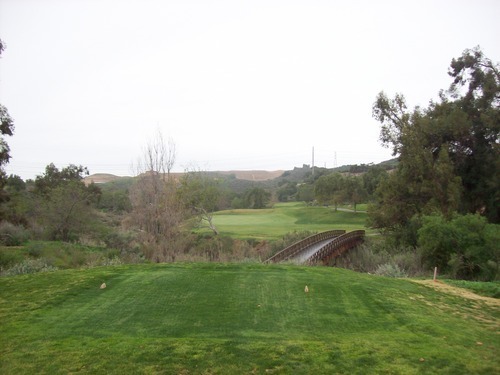 The highlight hole on Canyon Crest is easily the 9th, which is a strong finishing par-5. It features an elevated tee looking toward the clubhouse. 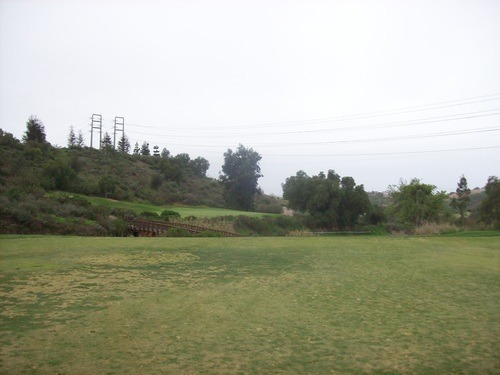 A lake runs along the right edge of the fairway and the landing areas get pretty narrow pretty quickly. 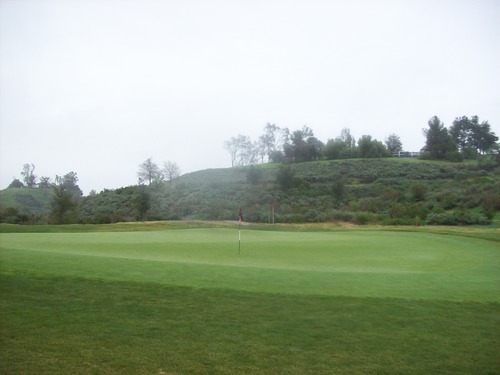 damp, yet playable and clearly well-maintained. 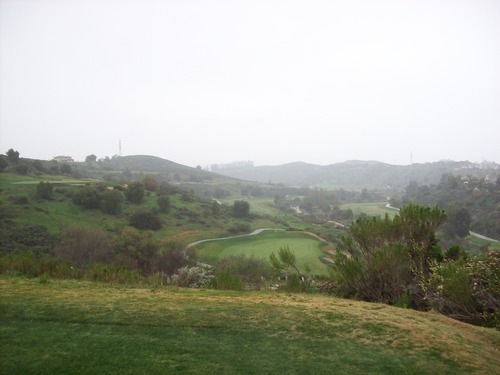 Moorpark Country Club is one of the top options in Ventura County. Their normal rates are pretty inflated and that’s what will keep me from coming here on a regular basis. 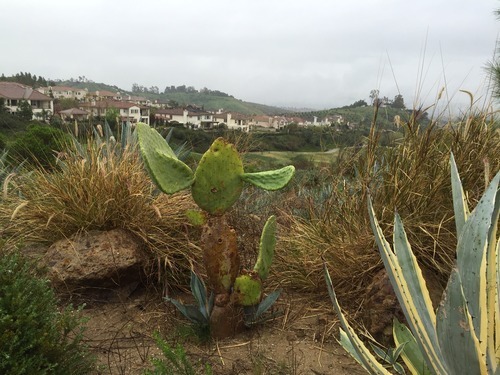 On my Regional Rankings pages, I previously had Moorpark as my #1 course in the county, but I think it may go down a notch or two after this visit. 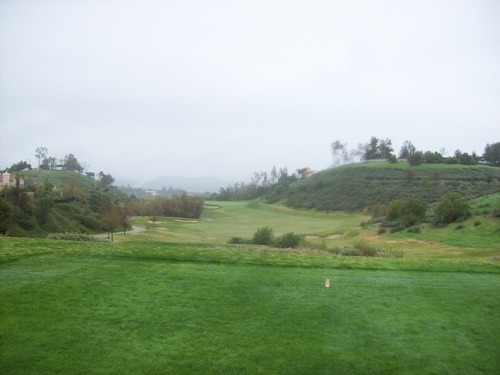 Now that I’ve played here, Ojai Valley Inn and Rustic Canyon twice each now, I have a little different perception of all three. 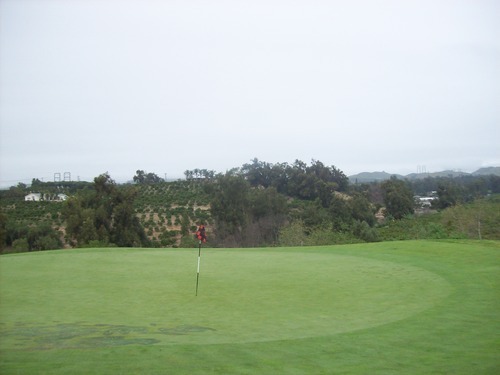 I will say the staff here is great and the starter especially was very friendly and helpful as I waited for my tee time. I did my best with the rainy and miserable conditions!